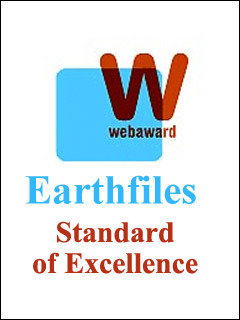 July 21, 2003 – A sampling of recent formations in Wiltshire and Hampshire counties of southern England where so far, there have been forty-five formations reported in 2003. And an eyewitness report below about strange orange lightning seen from Knap Hill the night before a formation was reported at Windmill Hill on June 22, 2003. 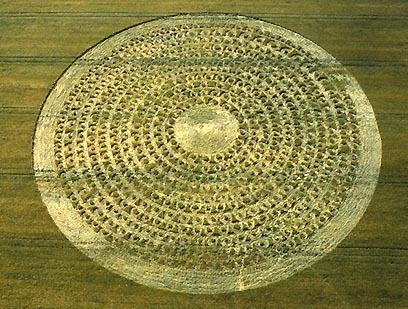 Thirty-two perimeter circles on thin spokes that intersect with seven interior circles at Hackpen Hill, near Winterbourne Bassett, Wiltshire, England, reported July 20, 2003. 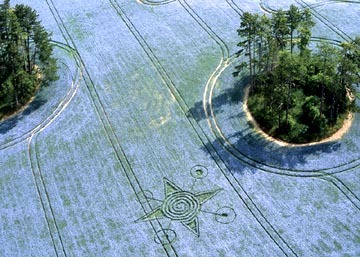 Aerial photograph © 2003 by Richard Harvey and Summer Garland. 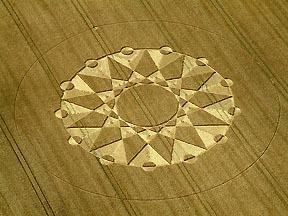 Thirteen perimeter circles and thirteen pointers at West Stowell, near Huish, Wiltshire, England, reported July 20, 2003. 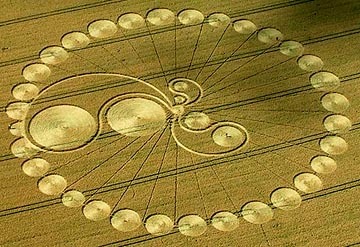 Aerial photograph © 2003 by Nick Nicholson and the Crop Circle Connector. Avebury Trusloe, near Avebury, Wiltshire, England, reported July 13, 2003. Aerial photograph © 2003 by Steve Alexander. 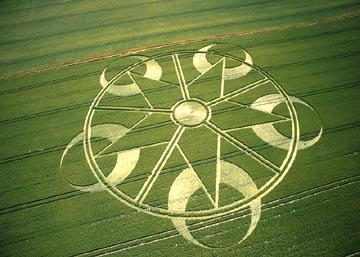 North Down, near Silbury Hill and Avebury, Wiltshire – Reported July 6, 2003. Dunley, Litchfield, Hampshire, England, reported July 9, 2003, in blue flowering flax. Aerial photograph © 2003 by Steve Alexander. 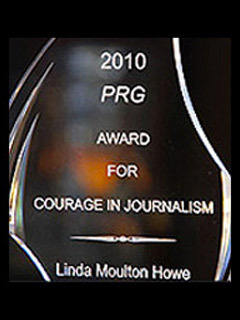 Litchfield, Hampshire, England, reported July 4, 2003. Aerial photograph © 2003 by Steve Alexander. Windmill Hill, Wiltshire, England near Avebury, reported June 22, 2003, after the strange orange lightning during the night seen from Knap Hill . 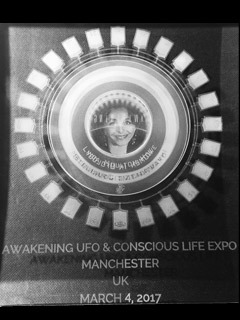 Aerial photograph © 2003 by Steve Alexander. Waden Hill, Wiltshire, England, northeast of Silbury Hill near Avebury discovered June 21, 2003. 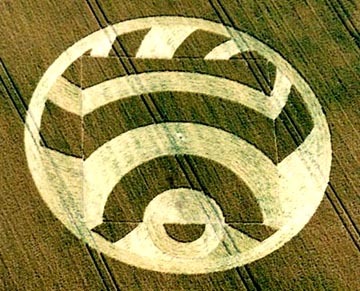 Aerial photograph g 2003 by Steve Alexander. 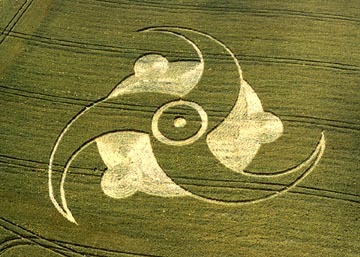 Above, the 5-fold swirled geometry was discovered at Windmill Hill near Avebury on June 22, about twenty minutes by car west of Knap Hill. That night of June 21 to sunrise June 22, 2003, strange orange lightning bolts were observed all night from Knap Hill by electronics contractor, Stephen Clementson, and a colleague joining him on the night watch. 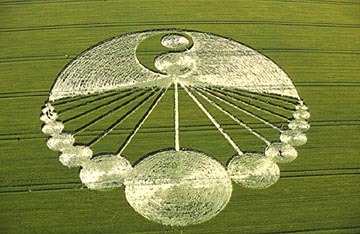 Stephen Clementson, electronics contractor, Welwyn Gardens City, Hertfordshire, England: “It was just gone midnight ­ we were doing a night watch on Knap Hill which overlooks the East Field where so many of the crop formations have appeared. There was lightning in the distance, but it was strange lightning. It was a very bright orange color, which is pretty damn rare. 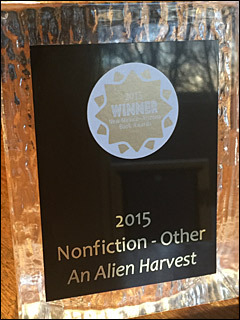 There was no noise coming from it. This lightning was striking the ground, and sometimes striking the ground twice in a second. And no noise! IT LOOKED LIKE LIGHTNING BOLTS, BUT THE COLOR WAS ORANGE? Bright orange. What happened was that it drifted in a great circle around us, but where we were stayed bone dry. There was no rain, no noise, just these lightning strikes going all the way through the night. It was actually still going at dawn. 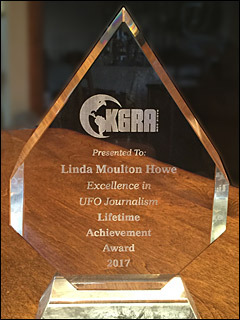 It wasn’t until around 7 a.m. that these heavy dark clouds rolled overhead and the hail and rain howled down. Silver white lightning was striking us quite closely over East Field and definitely was noisy. To make things stranger, there were lightning strikes between the clouds. At the same time, it looked like a cookie cutter had cut through the clouds and there was this glow inside, sort of a circle that was glowing orange. All in all, it was pretty weird. 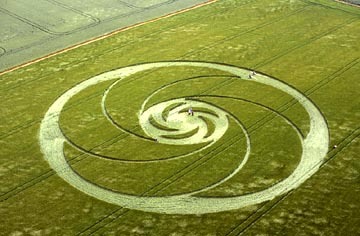 I heard people in the crop circle cafe over at Cherhill reported seeing orange lightning that night, too. BUT STILL NO FORMATION IN THE EAST FIELD.